It is no secret to many that I am a huge fan of getting my thoughts and feelings out by means of written words. While I have a digital blog, I still find myself running back to my pen and paper when it comes to the most intimate detailings of my life. There is always something about the feeling like you are spiraling into a mind racing abyss and holding a new journal that makes you recognize that whatever you are going to encounter can’t be too terrible, because those pages will always be there to greet you without judgment - ever ready to cradle your thoughts. I seem to start a fresh booklet during each new shift in my life, and I am constantly called back to those old pages to remind myself why I have carried on to the next new stories that life presents me with. 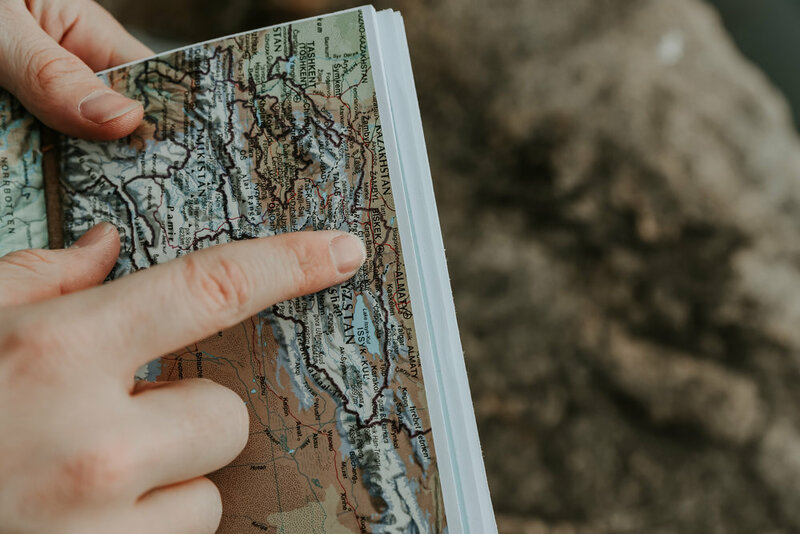 As I am leaving for the Middle East, this month, I realized that I needed to do this chapter of excitement, travel, and unforeseen wonders in a way that I have never done it before. That is when I found Tremundo. 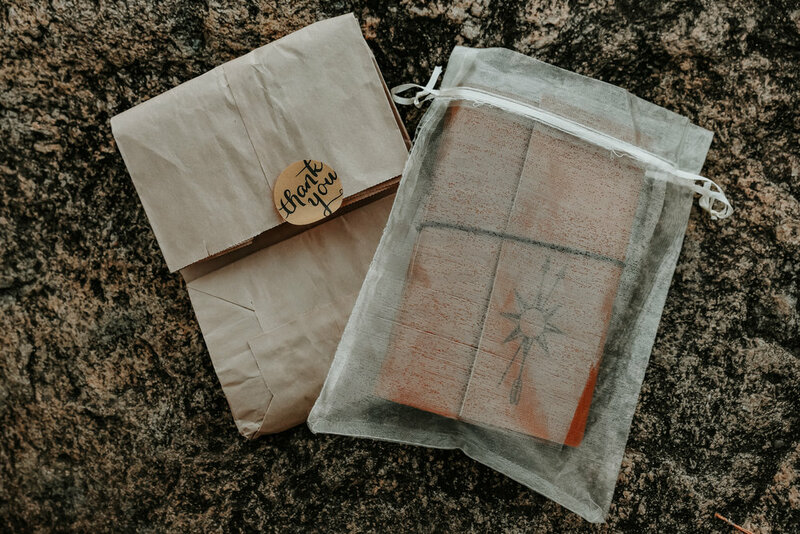 Tremundo specializes in handmade vegan journals, daring its users to set themselves apart from the rest and challenging each person to be their own authentic self. Their hope is to cultivate creativity, exploration, and the taking in time to enjoy the little things of daily living. What better way to do all of these things than in the company of pages, specifically designed to empower the curious side in all of us? Thankfully, Tremundo’s well-formatted platform makes it very simple to find the journal specific to your desires. Their website and Etsy shop lays out their products in a way that evoke sentimental thoughts, and you find yourself immediately attaching yourself to one such product. This was the case when I found the journal named “True North”. Being from Washington State and living in a southern area of America, I have found myself telling locals that I am from “up north”, to sum up my place of origin. And to find a journal that had a compass pointing in the same direction as my home, that was the first sign that this was going to be a perfect fit. But, it was in the description message that my heart was truly hit. 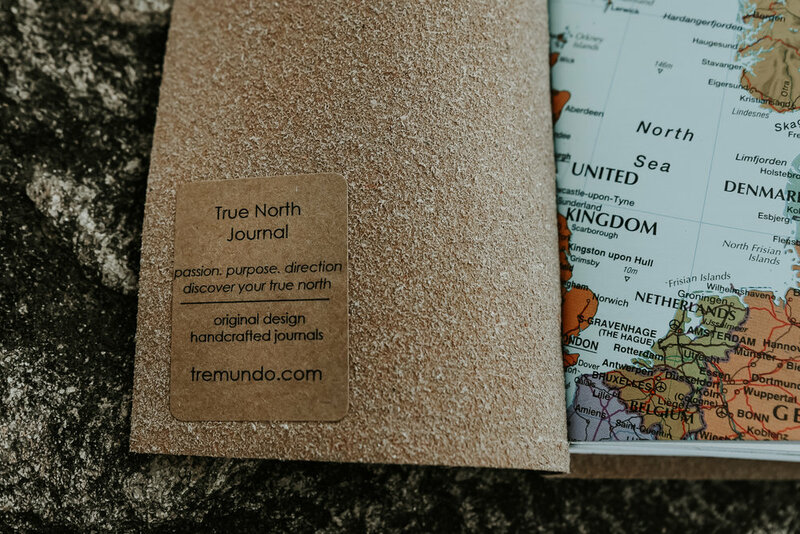 Tremundo writes within the description of True North, “within us all lies our true north, venture out to find your true north”. This could not ring more true to my life’s current chapter. While anxieties fill my mind of the travel that I am about to embark upon, I am constantly thinking about the person that I will be when I return from my explorations. Sometimes, I question if my entire outlook on life will change, or if I will even relate to those that I spent my formative years with. 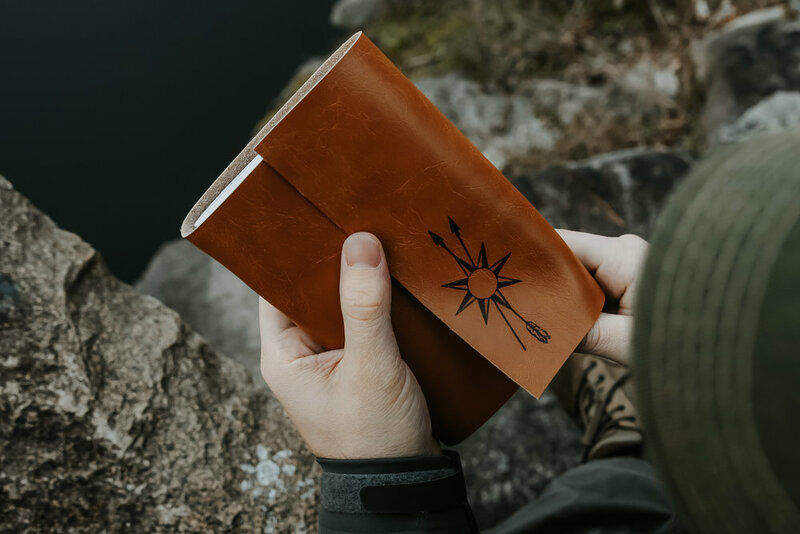 The heart behind this journal reminded me that there are many different avenues to find your true north - but that there is always one north, which is home. I may travel far and wide, but as long I remember to look down at this compass and arrow, I can recall each person that carried me to this next storyline. With my True North Travel Journal digitally ordered, I anxiously awaited its arrival. The package arrived priority mail, exactly when it was promised! And boy, was I excited! I opened the white envelope and found a simple brown recyclable bag, true to the company’s message of producing with natural/recyclable material. Enclosing the bag was a rustic yellow “thank you” sticker - a thoughtful touch! Upon opening, there was a delicate cream-colored mesh bag and my brand new journal, just calling for my written thoughts. I pulled the booklet out of the slip and there was my empty canvas - I felt such a rush of excitement thinking of how many different countries I would be bringing this with me. The tan cover felt soft and inviting - an experience of its own. But more so, I appreciated the tight black elastic around the folds - ensuring the privacy that I longed for in the pages. This travel journal was nothing like I have ever seen before, as every seventeen (or so) pages, there are inserts from a well-illustrated world map; you can almost feel the peaks and valleys on the print. It was here that I realized the significance in this 5x7 capsule - I can and will be seeing many of these locations included. I saw the first inserted map which included Berlin, ‘this is where I will be spending a month studying for my master’s degree!’ Continuing through to Ireland, Scotland, and Wales where I hope to gain an internship, or at the very least see each Game of Thrones filming location! Then, to Sweden, Finland, Russia and even Kyrgyzstan where my husband pointed out to a city and said, “I have been here”. But, what was so special is that Tremundo made sure that a little piece of my home country would stay with me, as maps of Florida and Illinois were tucked neatly in place. I cannot be more thankful for this partnership with Tremundo, as their company has opened my eyes to just how much excitement that I have for my upcoming travel lifestyle. I have never been far outside of the United States or Vancouver B.C., and the thought of potential loneliness has occasionally crept in. But, this journal has reminded me that I will always have a home in my “true north”. And inside this new chapter, there are a thousand stories to be told. In each adventure, my Tremundo journal will be by my side - waiting for my words of plans, hopes, fears, and new findings. All of which will be transferred digitally and shared with you all, along the way! Tremundo wants to offer you the same experience that I had, for whatever season of life you are in. Whether you are planning your bucket list, traveling, or just wanting to find a unique way to express yourself - this company has your desires in mind. With their prompt response time and insane attention to detail, this is a purchase you do not want to miss. Make sure you visit their shop at www.tremundo.com and use the code TRAVEL2019 to receive 20% OFF the total of your order! Comment below and let me know how much you love yours! I am so excited to take part in their product, with you.